Q. 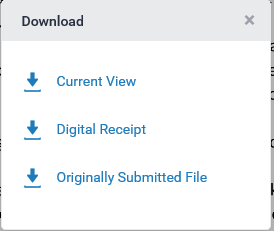 How do I access and print the digital receipt for my assignment? After the submission has been successfully completed, a digital receipt is displayed on-screen. A copy of this is sent to your Western Sydney University student email account. The receipt is your proof of a completed submission and you should keep it until you have received all your marks back. Reports can also be downloaded as a PDF copy to save to your computer. Select the ‘digital receipt’ option.